Spring is on its way... my first flowers have started blooming. 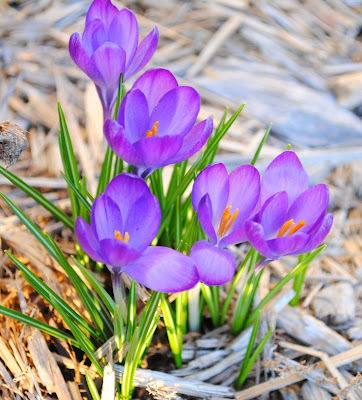 I love when the crocus start to bloom because they are the first thing that comes up and it seems like they bloom almost overnight. One day there is nothing and then all the sudden there are all these little purple flowers. They are so cute, like baby tulips. 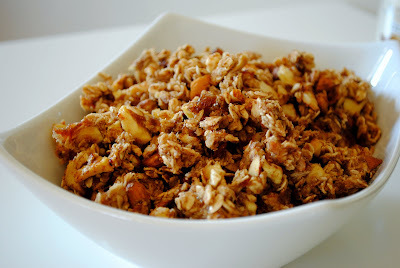 The base of this granola is unsweetened applesauce and it uses honey to sweeten things up. I added dried apples, chopped dates, almonds and ground flax seed along with the oats. Making your own granola is extremely easy, just toss everything together and bake and it keeps well in an airtight container. Preheat oven to 300 degrees and line a large rimmed baking sheet with a silpat or parchment paper. Combine all ingredients in a large bowl and mix with a wooden spoon until wet ingredients are thoroughly incorporated. Transfer to prepared baking sheet and bake approximately 1 hour, stir/turn after 30 minutes. Let cool completely and then transfer to an airtight container. Yum! I'll be making this ASAP! Oh, your crocus is gorgeous! I can hardly wait until ours start popping out! Your granola looks so delicious! I have never made it and I think this is the perfect recipe to try doing it. I love the fruits in it! Thanks! This turned out not to be sweet enough or sticky enough. I had to add a lot of brown sugar.